Warning: Some extreme navel gazing ahead! 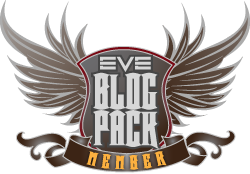 When I started Eve in September of '06 I had no intention of role playing or writing fiction for my character or any of that stuff. I just wanted to play internet spaceships. 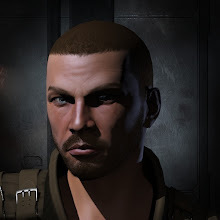 But shortly after I started I created a second character to fool around with, called him Korannon and gave him a beat up look with metal plates in his face (ah, the good old character creator). I was on my back looking up at the bank of flourescent lights overhead. My ears were ringing. I could smell something that was like burned meat. I propped myself up on an elbow and saw there was blood on my hands and my shirt. I couldn't move my legs because there was a body on them. My brother. The side of his face was melted, blood oozing from where his cheek used to be. His right arm was cut off above the elbow, his bright red arterial blood pumping out, slower with each beat. The man who shot him, the man who tried to shoot me until my brother jumped in the way to protect me, was walking towards me and aiming his pulse rifle to finish the job. I couldn't move, I couldn't scream for help. Anyone who has read my series 1 recognizes the basis of the climatic fight between Kirith and Korannon against Rusack. Sure the details changed in the actual story but the concept is the same. So that scene percolated in my head for three years. Finally in October 2009 I decided to exercise my fiction writing skills once more and started out with the goal to take that scene and make it the climax of a story. Over five months the tale was spun and I had a good time doing it and people seemed to like it. But I found myself with loose ends. How did Derranna get out of slavery? What happened to Korannon? When did Kirith become disillusioned with the Caldari state? And so forth and so on. So began series 2 and the seeds for series 3. Regardless, I do like how in the third arc he has grown as a character to more readily adapt to unexpected circumstances and deal with them more handily. I've striven to create believable characters with flaws that we can relate to. Kirith has his drug problem that will continue to play a part in his development, Derranna and her fear of freedom and dependency on a master, Korannon and his social awkwardness (which he is growing out of as well, just off screen I suppose). 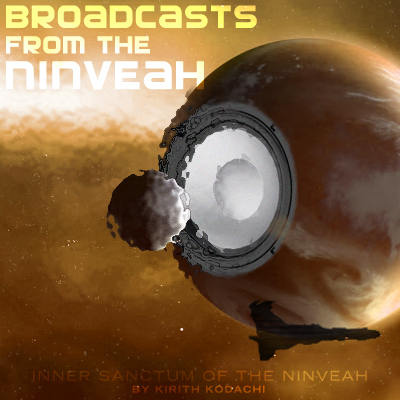 I haven't had time to explore the issues Kirith will run into with his new family in the IPRC corporation, but next arc will begin to highlight them. Its important to me to not create superheros with my characters because much of it can run into wish fulfillment which leaves me cold. I'm not a fan of Superman who has no fear of bullets or knives and can simply fly to the rescue with his super strength; I'm a Batman guy who likes his hero to have to struggle to defeat his opponent's. I do plan to take the fiction I've written so far and compile it with some editing into a single document that people can read as a novella instead of weekly installments. While the three series are distinct arcs they may work as Part I, II, and III of a single volume. Opinions are welcome on the matter. So what's next? Well, the next series delves more into pod pilot corporate relationships, and a bit of an Amarrian honour revenge plot.